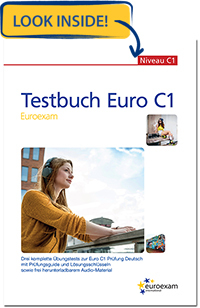 Each Euroexam level comes with a Practice Test Book, so anyone preparing for an A2-level exam can take advantage of this resource published in the popular and user-friendly “3-in-1” format. 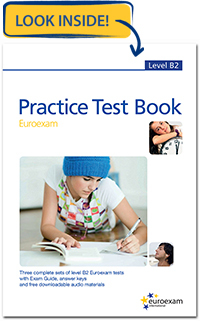 The A2 level testbook features 3 complete practice exams. All the tasks in the book come from past exams, while completely matching the format and requirements of the current exam. How can you, the candidate, best use this book? You can either complete one whole exam or at least one of the tests (e.g all tasks of the Listening test) or have the option of choosing one task type and doing all 3 examples of it one after the other (e.g. Reading-Headline Matching). 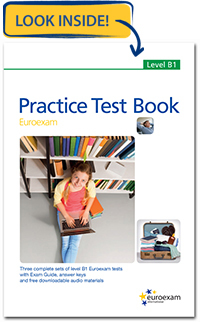 This testbook offers the well-established “3-in-1” format containing 3 complete exams with authentic exam tasks, answer key and downloadable audio files to be uploaded to your phone or media player. 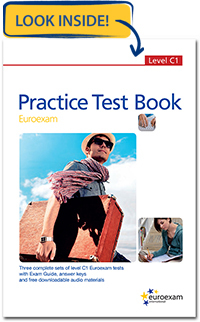 In this testbook format, you can follow two approaches. Either you complete all the tasks of a whole exam or at least one complete test (e.g. Reading), keeping the time limits and all other requirements in one go. You can develop a certain skill in a concentrated way by doing the 3 tasks of the same kind (e.g. Listening-Making Notes). Our candidates especially appreciate that there are 6 sample picture stories included for Task 2 (Picture Story) of the Speaking test, which is considered one the most difficult tasks in the whole exam. 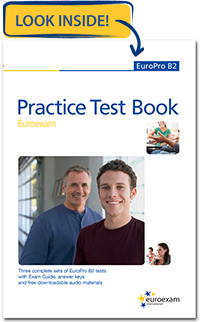 The Practice Test Book B2 is supposed to respond to candidates’ constant requests for as many real practice exam tasks as possible. As a result, the B2 testbook has been our bestseller in the series, after all, the B2 exam is the most coveted one among the lot. You can find three complete mock exams with answer key and freely downloadable listening material in it. Naturally, the format of the testbook is identical to that of the real exam, and you need not look for the evaluation criteria elsewhere, as those are also included. Another attractive feature is the inclusion of 6 sample picture stories, in other words, sets of pictures at your disposal for each test. This should be sufficient for your practice purposes for Task 2 (Picture Story) of the Speaking test. The “3-in-1” format allows you to not only practise and prepare by completing a whole exam in one sitting, but also by doing all 3 pieces of a particular exam task (e.g. Reading–Paragraph-Headings) one by one. This way you can develop that specific skill in a concentrated way. This testbook was also created in response to your please: “Please, give us more sample tasks.” Well, here you are. Three complete exams with authentic tasks from earlier exams, which comes with an answer key, free downloadable audio files and the evaluation criteria for both the Writing and Speaking tests. The format allows you to practise not only by completing a full exam in one go (which can be very time-consuming), but also by developing a certain skill in a concentrated way with 3 pieces from any type of exam task (e.g. Listening-Short Conversations). Complete a full exam (the Reading, Writing and Listening tests together) in one sitting, keeping all the time limits. If you have less time, complete at least all the tasks of one test (e.g. the Reading test from one of the exams). Develop a certain skill in a concentrated way by doing all three tasks of the same kind, (e.g. Listening-Meeting). Since candidates often worry about practice materials for the Speaking test, you will be pleased to find six sample task sheets for Task 2 of the Speaking test (Presentation), a task which is often considered one of the more difficult tasks in the exam. 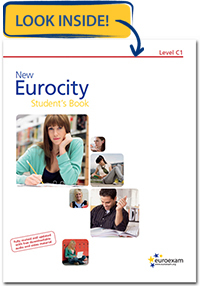 The Eurocity B1 offers preparation tasks for the exam and helps the learning with vocabulary and grammar practice. The 16 units of the book feature interesting, useful and fun topics, such as music, movies, cooking and holidays. 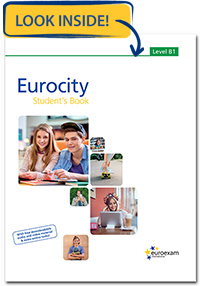 If you're preparing for the B1 exam, there is no better companion on your language-learning journey, than the Eurocity B1. Twenty-four. This is how many real exam tasks the Eurocity B2 coursebook contains in preparation for the B2 level general English exam. Enough learning material for nearly 40-50 hours of practice, together with free downloadable audio files and extended by Extra Online Practice Materials. Besides developing the language and exam skills necessary to complete the exam tasks successfully, there also useful tips and strategies to further boost your preparation. 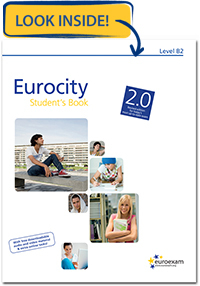 The 16 exam tasks in the 20 units of the Eurocity C1 2.0 coursebook guarantee thorough preparation for the C1 general English language exam. 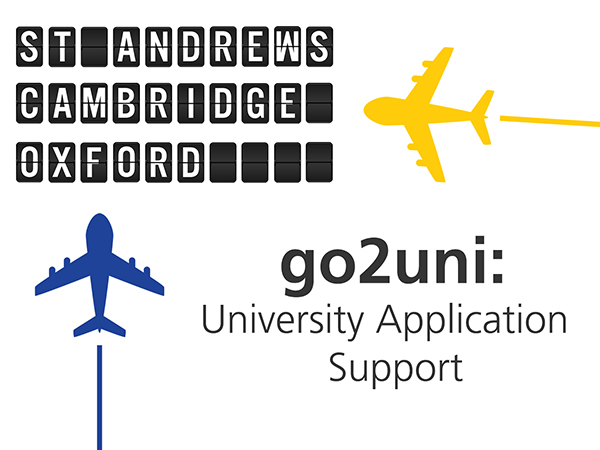 Each unit gives you both practice and skills development to best prepare you for all the exam tasks. At the same time, you will find a couple of units focusing on accuracy and vocabulary building, as we consider the practice and sharpening of these skills as important elements of exam preparation. The last unit is there to help you with the concentrated last minute tuning in for the exam. It goes without saying, that you can download every audio file of the book for free and instantly copy them to one of your media devices. 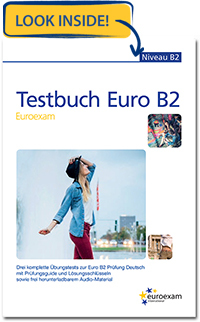 In the Testbuch B2 you can find three complete mock exams with answer key and freely downloadable listening material in it. 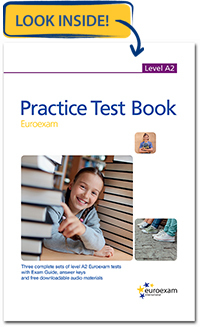 Naturally, the format of the testbook is identical to that of the real exam, and you need not look for the evaluation criteria elsewhere, as those are also included. Another attractive feature is the inclusion of 6 sample picture stories, in other words, sets of pictures at your disposal for each test. This should be sufficient for your practice purposes for Task 2 (Bildgeschichte) of the Sprechen part of the exam. The “3-in-1” format allows you to not only practise and prepare by completing a whole exam in one sitting, but also by doing all 3 pieces of a particular exam task (e.g. Leseverstehen – Überschriften) one by one. This way you can develop that specific skill in a concentrated way. This testbook provides a wealth of sample tasks for the would-be candidate. 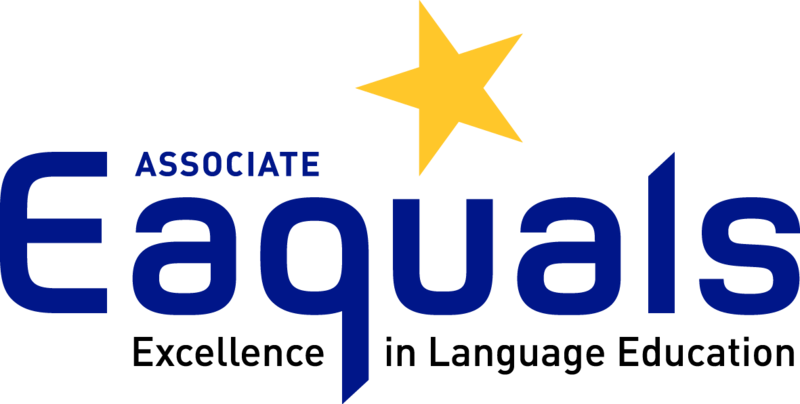 Three complete exams with authentic tasks, which come with an answer key, free downloadable audiofiles and the evaluation criteria for the both the Schreiben and Sprechen tests. The format allows you to practice not only by completing a full exam in one go (which can be very time-consuming), but also by developing a certain skill in a concentrated way with 3 pieces from any type of exam task (e.g. Hörverstehen – Kurze Gespräche). 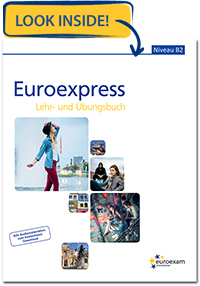 The Euroexpress B2 coursebook will prepare you for the Euroexam Niveau B2 with 60 hours’ worth of course materials and a full mock exam. Each chapter of the book focuses on a specific exam task with step-by-step preparation using real-life everyday situations. The book is a trove of exam tips and advice and an indispensable resource whether you are preparing on your own or with the help of a teacher. Coursebooks cost 12 euro plus postage and packing. Practice books cost 10 euros plus postage and packing. If you would like to order any of our publications, please contact us here. The audio for the new books is available in various formats. 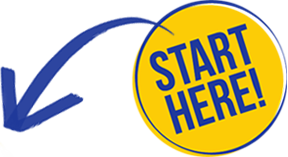 Download them onto your computer, phone, tablet or mp3 player for free and start practising your listening skills.